I ordered Multi-Probiotic 40 Billion by Douglas Laboratories because it met the criteria for the best content. I am a senior citizen with intestinal issues and after ten days, things are better. I am looking forward to long term relief. Multi-Probiotic 40 Billion by Douglas Laboratories has really helped with my many GI problems. These Multi-Probiotic 40 Billion by Douglas Laboratories are some of the best probiotics I've tried. 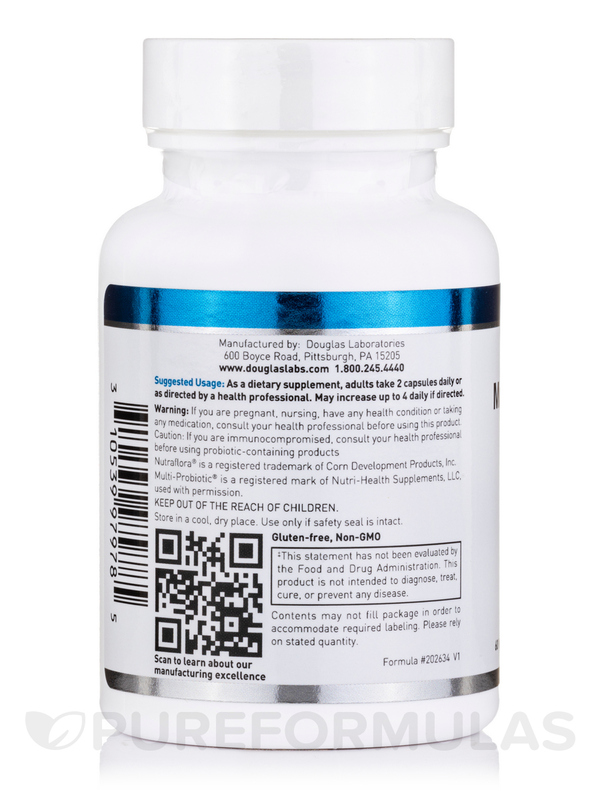 If you’re looking for a high quality‚ multi-probiotic supplement for digestive health‚ then Douglas Labs’ Multi-Probiotic Capsules may be right for you. 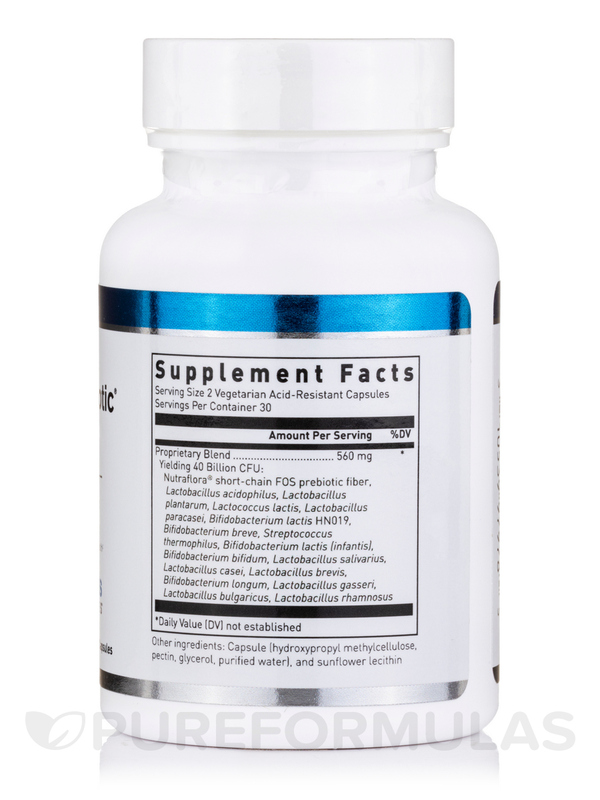 This supplement combines 16 strains of Lactobacillus‚ Bifidobacterium‚ and Streptococcus cultures to promote healthy intestinal bacteria. A population of beneficial bacteria in your digestive system is important for the proper breakdown of food for energy. There must also be a balance to minimize the population of harmful gut bacteria. 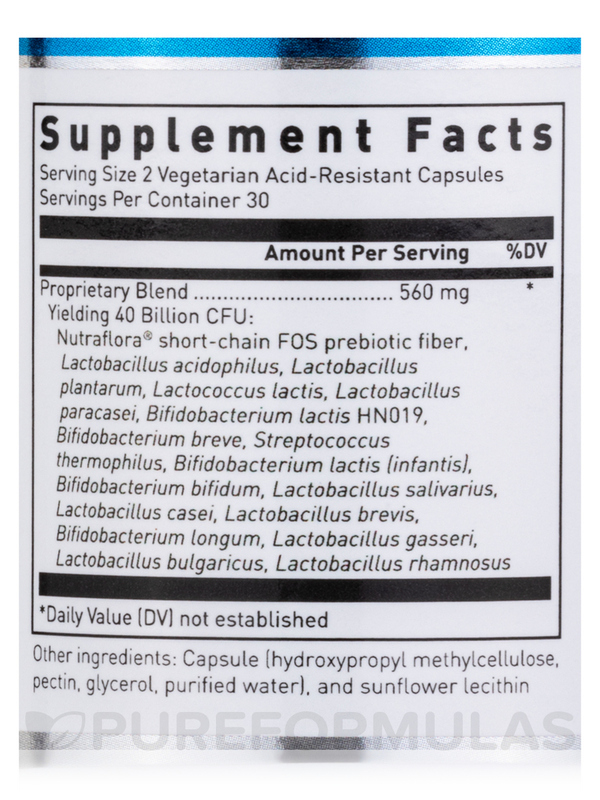 Douglas Labs’ Multi-Probiotic Capsules provide these beneficial microorganisms in a proprietary 40 billion CFU blend. Lactobacillus strains are capable of reducing harmful bacteria while promoting the absorption of nutrients from food. The same can be said about Bifidobacterium and both work together to ensure proper digestive function. 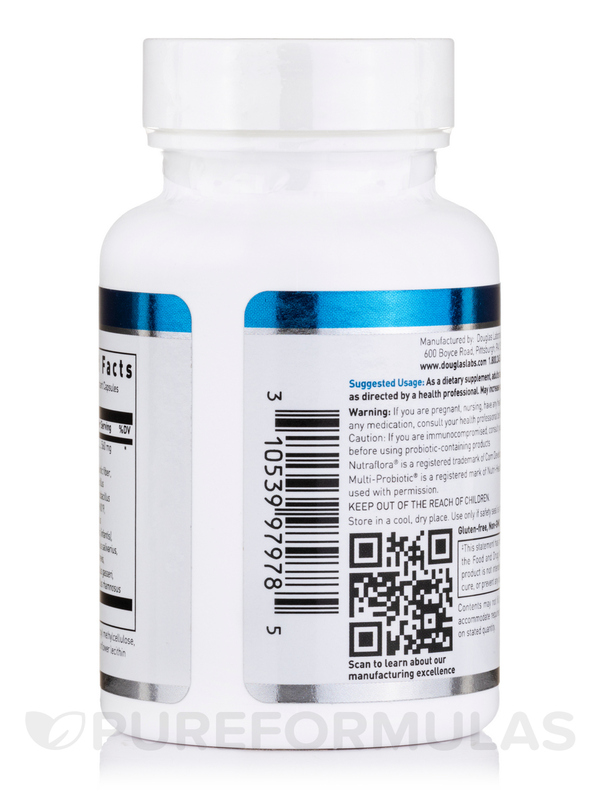 Douglas Labs’ Multi-Probiotic Capsules also contains a serving of short chain fructooligosaccharides (scFOS). These are prebiotics that influence the flourishing of beneficial intestinal bacteria. This supplement can be conveniently mixed in with unheated liquids or room-temperature food. Order Douglas Labs’ Multi-Probiotic Capsules from PureFormulas today! Short Chain Fructooligosaccharide (NutraFlora® scFOS®)‚ bifidobacterium bifidum‚ bifidobacterium breve‚ bifidobacterium lactis HN019‚ bifidobacterium longum‚ lactobacillus acidophilus‚ lactbacillus brevis‚ lactobacillus bulgaricus‚ lactobacillus casei‚ lactobacillus gasseri‚ lactobacillus paracasei‚ lactobacillus plantarum‚ lactobacillus rhamnosus‚ lactobacillus salivarius‚ lactococcus lactis‚ streptococcus thermophilus. Other Ingredients: Hydroxypropyl methylcellulose (capsule)‚ vegetable stearate‚ and silica. Take 2 capsules daily or as directed by a healthcare professional. May increase to 4 daily. Keep out of reach of children. For optimal storage conditions‚ store in a cool‚ dry place. (39°-77°F/4°-25°C) (35-65% relative humidity). After opening‚ keep refrigerated with lid tightly sealed. Tamper resistant package‚ do not use if outer seal is missing. 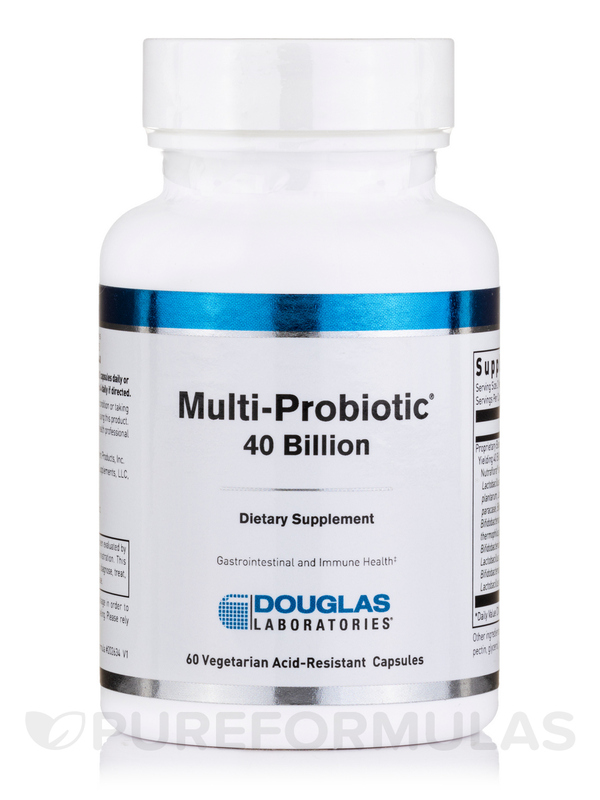 Multi-Probiotic 40 Billion by Douglas Laboratories best probiotic according to my Dr. I've been using it for a few years now. Husband and I have taking Multi-Probiotic 40 Billion by Douglas Laboratories for two weeks. Noticed better digestive health. We both suffer from IBS and feel less bloated and more regular. Stops stomach bloat and improves mood! This Multi-Probiotic 40 Billion by Douglas Laboratories is a great product: I open the capsules and put the powder into the kids' smoothies. I can tell a big difference in their behavior, especially when we run out! Tasteless in the smoothies, they don't even know I'm putting it in there. Some other brands have a weird taste they can detect. Occasionally, it seems like the company tries to pack too much into the capsules and I can't get them open, or, if I finally can, the contents are packed in so tight it's a solid lump instead of a powder and it won't dissolve. Happened with 2 bottles so far, but we've been through at least 20-30 bottles. Helps to maintain and correct the balance of healthy bacteria in the GI system. I've tried several and Multi-Probiotic 40 Billion by Douglas Laboratories one is definitely the best! Ran out and saw a great difference in my gut health. Now I know Multi-Probiotic 40 Billion by Douglas Laboratories really does work! Helps with indigestion, acid, ibs. Multi-Probiotic 40 Billion by Douglas Laboratories is just ok not really strong. The large number of bacteria and large variety of different strains. Capsule is easy to swallow. It can give a bit of stomach burn if not followed directly by food. I purchased Multi-Probiotic 40 Billion by Douglas Laboratories because we were going to be traveling and couldn't keep a probiotic cold. This kept me digestion in order while traveling which is usually very difficult for me. No refrigeration, keeps gut healthy with traveling. Would it be harmful to take an additional prebiotic with this? Hi Chris, we do apologize but we would not be able to know if taking an additional pre biotic would be harmful to you since every human body does react and absorb supplements differently. We do recommend to speak to your health care practitioner to know safely and accurately if this would be safe for you to do. Can this product be frozen? Maybe order larger quantities? What is the expiration date of this product?. You offer ice pack delivery for $24.99, how important is this? Does this product need to be refrigerated at all times? Laura, The expiration date we have at this time is February 2017. For optimal storage this product should be kept at 39-77 °F / 4-25 °C. After you open the bottle, it should be stored in the refrigerator. We recommend the cooler to keep the product cool while in transit to you, but it is up to your discretion whether you would like to use it.